Natural selection is the gradual, non-random process by which biological traits become either more or less common in population as a function of differential reproduction of their bearers. It is a key mechanism of evolution. The term "natural selection" was popularized by Charles Darwin who intended it to be compared with artificial selection, which is now called selective breeding. Birds became very important to Charles Darwin as he studied them on different parts of the island and saw for different food sources the birds had specially adapted beaks. 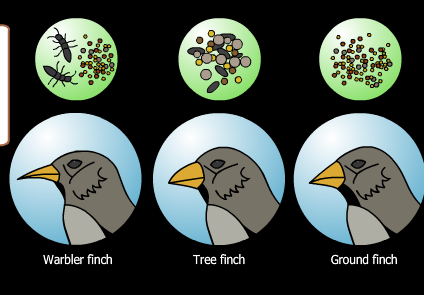 These three finches have specially adapted beaks for different types of food. The Warbler Finch has a long sharp beak for skewering insects. The Tree Finch has a bigger beak for eating larger nuts. The Ground Finch has a small beak for eating small amounts of food and leftovers left on the ground. This fun yet educational twist to history shows you about Charles Darwin's theory of natural selection.